Alack of written sources makes it difficult to trace the early economic history of much of the African continent, especially sub-Saharan Africa. What is clear is that Africans in precolonial times had basic economic activities that provided them with the things they needed to survive. At the same time, however, many factors limited the kind of intensive economic development that occurred in Asia and Europe. Much of Africa’s recent economic history is linked to the period of European colonialism, from the late 1800s to the mid-1900s. 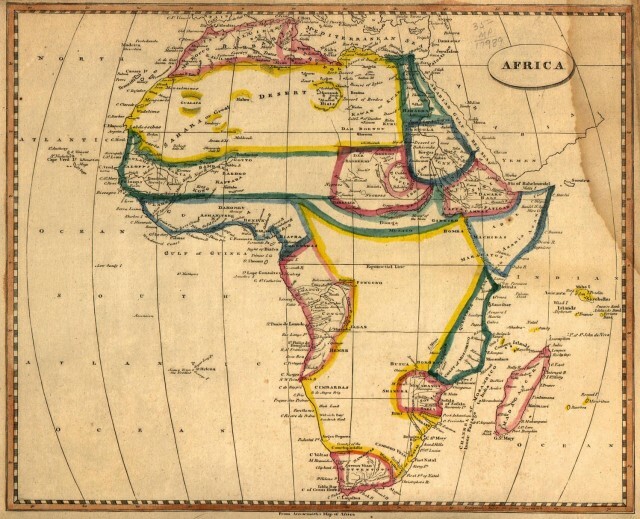 The nations that colonized Africa saw the continent as a vast source of untapped wealth. Only after many false starts and much wasted investment would they recognize the forces that had held back the African economy for centuries. Africans provided for their own economic needs and traded among themselves long before they had contact with other peoples. However, scholars have different views on the nature of these early economic activities. Economic history begins with the appearance of agriculture and the domestication of animals. These two developments pave the way for settled communities that not only provide for their basic needs but also produce surplus food for trade. In addition, agricultural surplus leads to the creation of specialized groups—such as traders and artisans—who are not involved in food production. Food surpluses also stimulate trade and commerce between neighboring societies. Africans living in the SAHARA DESERT had domesticated cattle as early as the 6000s B.C. African agriculture, which developed around the late 1000s B.C. in the SAHEL region, spread to southern Africa by the A.D. 100s or 200s. For several reasons, the shift to agriculture did not always result in dramatic increases in productivity. First, the most common farming method was swidden, or slash-and-burn. This method, involving small parcels of land and little irrigation or fertilizer, usually produces low crop yields. Second, the poor soil and unpredictable rainfall found in much of Africa makes it almost impossible to count on consistent crops over a long period of time. Third, Africa’s geography makes transportation of goods extremely difficult. The terrain in the interior is rugged and unhealthy for the large animals often used to haul goods. Moreover, most rivers in the interior are navigable only for short distances, and Africa has few natural harbors along its coasts for shipping cargo. Because of the problems in transporting goods to distant markets, farmers had little reason to produce surplus food. Another factor that slowed agricultural improvement was the lack of population pressure on the land. Until recent times, the overall population of Africa remained fairly low, partly because of the presence of many disease-carrying organisms. Furthermore, Africa contained abundant open space. When the farmland near a village became less fertile, some inhabitants simply moved to new areas. The SLAVE TRADE, which flourished between A.D. 800 and 1900, removed as many as 20 million people from Africa, further decreasing the population. Finally, African cultural values, which placed little value on goods and money, did not promote the production of surplus food for trade. The situation in North Africa was different. There irrigation along bodies of water such as the NILE RIVER made intensive cultivation possible. EGYPT grew into a prosperous society by the 3000s B.C. and developed numerous connections with the ancient Middle East. By the 400s B.C., the city-state of CARTHAGE in present-day TUNISIA became one of the leading commercial powers in the Mediterranean world. With the Sahara desert acting as a barrier to migration, densely populated societies grew up in the fertile areas of North Africa. Despite various difficulties, trade and commerce did occur in precolonial Africa. Scholars have uncovered evidence of early exchanges between farmers and cattle raisers. Members of these groups also traded with hunting, fishing, and metalworking peoples. Such trade, however, was mostly local. In sub-Saharan Africa, trade with groups outside the region developed very slowly. As early as the A.D. 100s, merchants from Southwest Asia were trading along the East African coast. By the 500s, camel caravans began to cross the Sahara, creating commercial links between sub-Saharan Africa, North Africa, and the Middle East. Trade developed more easily in North Africa. As early as the 400s B.C., Carthage was exchanging manufactured goods with people on the Moroccan coast and obtaining tin from northern France. Carthaginian merchants were a common sight in the marketplaces of ancient Greece. Early Egyptian commercial ties extended to the kingdoms of Sumer and Babylonia in the Middle East, and ancient Egyptians conducted regular trading expeditions to SUDAN and ETHIOPIA. The Romans obtained many goods from North Africa, including grain, olive oil, livestock, timber, and marble. The most common early exports from sub-Saharan Africa were gold, slaves, and ivory. Items of lesser importance included timber, spices, vegetable oils, and rubber. For hundreds of years, Africa was the major source of gold for the Mediterranean region and South Asia. The search for gold also motivated the earliest European trading voyages to Africa in the A.D. 1400s. For Europeans, the importance of African gold declined after they began to explore the Americas and to develop gold mines there. Slaves made up an important part of sub-Saharan Africa’s trade with North Africa, the Middle East, and Asia during the Middle Ages. In the 1500s European plantation owners in the Americas became the main customers. After European nations abolished slave trading in the 1800s, Muslims took over the commerce. Islamic involvement in the African slave trade reached its peak during the 1800s and did not stop until toward the end of that century. During the precolonial era, Africans generally exported raw materials in exchange for manufactured goods, primarily textiles, metal goods, weapons, and shells and beads. In some cases, Africans used imported products, such as iron bars, to make manufactured goods. Beads and shells often served as currency as well as consumer goods. By and large, Africa’s foreign trade affected coastal peoples much more than those living farther inland. Few imported goods reached the interior. By the beginning of the colonial era in the late 1800s, the market for many of Africa’s exports had declined sharply. Some, such as slaves, were no longer in great demand. Others, such as vegetable oils, were being replaced by cheaper alternatives from other sources. However, colonialism led to a revival of exports from Africa as Europeans took for themselves what they previously had obtained through trade. At first, the European nations that colonized Africa gave private companies the rights to exploit the continent’s natural wealth. Most of these companies, however, failed because of the high cost of setting up mines or plantations and of building roads and railroads to transport products. By the early 1900s, European governments had stepped in to administer the colonies and oversee African exports. Over the next 60 years, trade and commerce between Africa and other parts of the world increased significantly. African mining was highly successful. By the mid-1930s, Africa supplied almost all the diamonds, half of the gold, and about one-fifth of the copper sold worldwide. Other important mineral exports included manganese, asbestos, and phosphates used in fertilizer. The increase in exports helped stimulate the development of new manufacturing and service industries in Africa. In western Africa these new businesses were largely in the hands of Africans, but in eastern Africa they were dominated by Asian immigrants. Few of the new industries developed into large-scale companies. In southern and central Africa, the growth of mining and manufacturing led to a greater demand for food. The colonial powers’ agricultural efforts, however, were much less successful than the mining operations. The large plantations were often no more efficient than smaller farms. Moreover, colonies with agriculture-based economies often focused on a small number of crops and suffered when demands for those products dropped. In many areas, African peasants became skilled at growing and selling cash crops. Rural incomes and standards of living were higher in places that featured small-scale farming rather than plantation agriculture. The human cost for the colonial powers’ focus on exports could be high. Governments and private companies often resorted to harsh methods, including forced labor, to ensure production. Africans were often denied access to land and to employment in skilled positions. In the late colonial period, a huge gap developed between urban and rural incomes. In the early years after independence, most African economies continued to grow fairly well. However, the difference in incomes between urban and rural populations led to increased migration from the countryside to the cities as people searched for economic opportunities. By the mid-1960s, increased government spending on education resulted in large numbers of educated but unemployed youths in cities. Under pressure to provide more jobs, many governments expanded their role in the economy. Bureaucracies grew and government-owned and operated businesses multiplied. Most of these businesses were highly inefficient, employing far more people than they could reasonably afford. To increase revenues, leaders began to restrict imported goods that competed with locally produced items. They also kept the value of their currencies artificially high compared to foreign currency. In the long run, however, these policies reduced the price of exports and caused export earnings to shrink. The effect of these postcolonial economic policies was dramatic. Between the late 1960s and 1980, agricultural exports fell by one-third. Mineral exports fared better, but in some countries they fell by up to 40 percent. Low prices for crops and minerals during the 1970s made the problem worse by lowering revenues for the goods that were exported. Personal incomes fell and unemployment soared, reducing government tax revenues. To balance their budgets, African nations borrowed large sums of money from other countries as well as from institutions such as the World Bank and the International Monetary Fund. By the late 1980s, African economies were in serious trouble as their debts mounted and economic growth continued to decline. The combination of reduced tax revenues, declining export earnings, staggering national debts, and growing political and social unrest forced African leaders to rethink their economic strategies. At the same time, nations and institutions that had lent money began to demand changes in the way African nations did business. Lenders forced many African countries to adjust the value of their currency to reflect its true value in the world marketplace. They also demanded an end to import restrictions and price controls. Many state-owned enterprises became private companies, and the size of government payrolls was cut. Even spending on social programs was reduced to help balance government budgets.